Both the men’s and women’s soccer teams played in their final regular-season matchups this past Wednesday as they both lost to the Wildcats of Indiana Wesleyan University. The men fell 3-2 to the Wildcats; the women lost 2-0. The men’s team hosted IWU as they honored all nine seniors: Tyler Born, Johan Escalante, Ethan Francois-Ravalier, Tevin Gilkes, Spencer Aeschliman, Nate Nussbaum, Ari Benjamin, Alejandro Rosales and Murray Cockburn. The winner of the match would claim the eighth and final seed in the Crossroads League tournament. As play began, tensions were high and the players were giving it their all, not wanting their careers as Maple Leafs to end. In the seventh minute, Ollie Smith, a junior, stole the ball at midfield and passed to teammate Murray Cockburn. Cockburn took the ball to the corner of the 18-yard box and sent a rocket into the back of the net. The Maple Leafs, in a fog of purple smoke thanks to the rowdy student section, took an important 1-0 lead in the first half. Goshen used their momentum to keep applying pressure on the Wildcats, but after what would be a costly turnover by the Maple Leafs defense, the Wildcats sent a cross into the 18-yard box off the foot of Glauber Oliveira to leading goal-scorer Filipe Mendonca in the 21st minute. The teams went into halftime with the scoreline at 1-1. Indiana Wesleyan outshot the Maple Leafs nine to two. In the second half, the Wildcats jumped out on top quickly. They were able to net a goal just three minutes into the half off the foot of Mendonca for his second goal of the game. After the goal, the Wildcats stole the momentum from the loud Maple Leafs crowd. IWU were able to find the back of the net again just two and a half minutes later to lead the game 3-1. The deficit was now two for the Maple Leafs with the season on the line. Goshen began pressing the Wildcats offensively and were able to accumulate nine second-half shots. In the 62nd minute, the ball bounced off an IWU defender to Stuart Aeschliman, a sophomore. Aeshliman struck the ball from just inside the 18 to score for the Maple Leafs. The lead was trimmed to one. The Maple Leaf fans were loud, encouraging their team as the players continued to take dangerous shots. But the Maple Leafs could not find one more goal to even the score. The Wildcats ended the Maple Leafs’ postseason hopes with the end scoreline reading 3-2. Though the men’s team season had come to an end, the women’s team were still fighting for theirs as they traveled to take on the Wildcats. The women need to either win or tie their game. A loss would require them to rely on Saturday’s make-up game between Bethel and Huntington. Due to field conditions at Indiana Wesleyan, the game was moved to Oak Hill High School in Converse, Indiana. Goshen held the Wildcats scoreless for 38 minutes with sophomore goalkeeper Katie Baer making five saves. With seven minutes left in the game, IWU’s Hannah Severs crossed the ball into the box which bounced off Goshen’s Kayla Shaw’s leg and into the back of the net. With nine seconds left in the first half, the Maple Leafs thought they had equalized with a shot from Taliah Borom. Borom struck the ball from outside of the box which just sailed a few inches over the crossbar. The end of the first half saw the Wildcats leading the Maple Leafs 1-0 and outshooting them 11-3. The Maple Leafs started the half with solid defense. The Wildcats would not score their second goal until the 76th minute when Severs sent another ball into the box. This time, it found the head of teammate Tia Sanford who increased the Wildcats’ lead to 2-0. The Wildcats held their lead for the remainder of the game, forcing the Maple Leafs to rely on Saturday’s match between Bethel and Huntington. 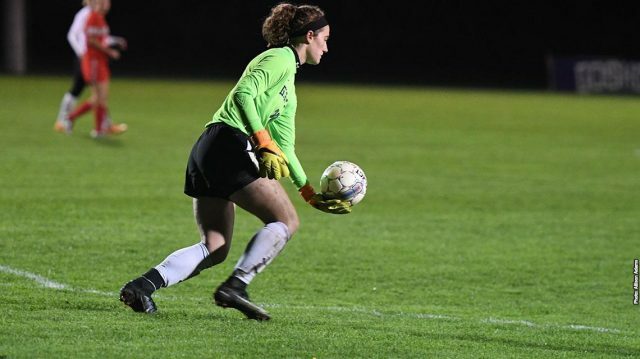 For 95 minutes of play, the game remained goalless, giving the Maple Leafs hope of an eighth-place finish and a spot in the conference tournament. It wasn’t until the fifth minute of overtime when Huntington’s Millie Adams put the ball into the back of the net, ending the game 1-0 and the hopes of the Maple Leafs’ season continuing. With both teams’ 2018 season coming to an end, the men’s team final record stood at 7-9-2 and 2-5-2 in conference. The women’s final record ended at 6-8-2 and 2-7 in conference.